What good could President Zeman’s speech on the Novichok poison bring to the Czech Republic? No good, absolutely none, it only hurts us. Novichok is the poison, used by the Russians on their former double agent spy Sergey Skripal and his daughter in Britain in March . Russia claimed that the substance could come from, among other countries, the Czech Republic. Ministers of the Czech government, military experts and the Institute for Nuclear Safety clearly stated that we did not produce Novichok in our country. Prime Minister Babis said that “Russia has crossed the line” when it named the Czech Republic as a possible country of origin for Novichok. The statement by Moscow led to the expulsion of three Russian agents working in the Czech Republic under diplomatic cover. President Zeman responded by taking Putin’s claims seriously and publicly charged the BIS secret service, working in secret, to find out if Novichok was produced in our country. Zeman said on Thursday: “In November last year, in the Research Institute of Defense of the Ministry of Defense in Brno, produced a nervous paralytic poison called A230 and tested it, the amount of poison produced was reported to be relatively small and after testing this poison was destroyed. Secondly, the State Office for Nuclear Safety, says that it was not Novichok but some other product, but I received a report from the Military Defense Intelligence in which it it is explicitly stated that the A340 is Novichok. Notes: Military intelligence claims there is no A340 poison. Zeman also spoke about the Military Historical Institute, although it does exist, of course the poisons do not either. On the contrary, Zeman reaches the conclusion that Agent Skripal and his daughter were poisoned by the A234 poison. Zeman could have rationally said: The A234 Poison, that poisoned by Skripal and his daughter, was neither produced nor tested by the BIS witness and the Military Intelligence. – That would be true, but would not make international headlines. Zeman supported Putin’s interests once again. What about Czech national interests? Did Zeman help the Czech Republic, an EU and NATO country and an ally of the British kingdom? No, just the opposite. Zeman has questioned the Western process (the expulsion of Russian diplomats). The Russians immediately took advantage of it. Zeman badly damaged Czech interests. It makes us a treacherous country that frowns upon the investigation of the Skripal poisoning. In the West, he raised into question the reliability of Czech secret services, destroying their credibility. Zeman’s tactic is to deliberately destroy his own country in order to help the Russians at any cost. He can count on a few facts: secret service managers are not allowed to talk about classified things. As well as other persons including the Minister of Defense. The president himself is untouchable, except for treason, he is above the law. His behavior is treasonous, but Zeman counts that no one will pursue such chrges. Let’s try to think: in what way could Zeman’s Barrandov performance help the Czech Republic? I repeat, according to a variety of expert reports, the poison used on Skripal was not produced by us. The Czech Republic (and Britain) do not benefit from his statements in at all. It just hurts. It is a lie to promote Russian Propaganda. 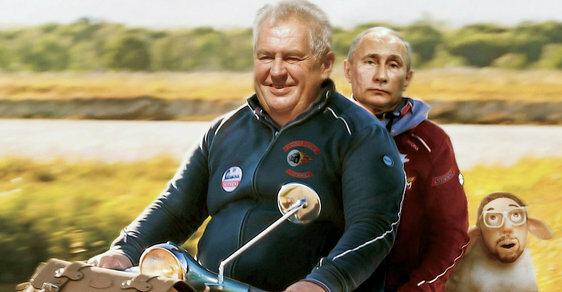 Zeman is the Putin’s fifth column in Prague.